Enbrel is a biological DMARD. 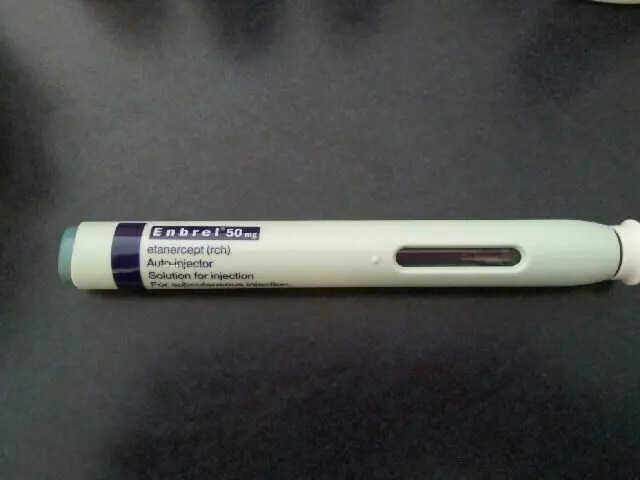 Enbrel is an injectable drug that works by blocking Tumor necrosis factor alpha (TNF alpha), a cytokine implicated in inflammatory arthritis. TNF alpha promotes inflammation in the body and its associated symptoms – pain, swelling and tenderness. TNF alpha is produced by the body when there is inflammation. Enbrel is a synthetic man-made protein that binds to the TNF-alpha, and so it acts like a sponge to remove most of it from the blood and the joints. The most common side effects are injection side reactions – itching, pain, redness, swelling and bruising at the site of the injection. Headache, dizziness and nasal and throat infections can occur. Serious side effects can occur. Enbrel raises the risk of some cancers, especially lymphoma. , Multiple sclerosis, myelitis, optic neuritis and other diseases of the nervous system have been reported. Low blood counts have been seen with Enbrel and other TNF blockers. Congestive heart failure is also a risk. Lupus-like syndrome has also occurred. The medication should always be discontinued if there are any signs of infection, including fever. No special monitoring is necessary. Patients must be checked for tuberculosis before treatment commences. Enbrel is an immune system suppressant, and patients with serious infections should not receive Enbrel, and it should be discontinued if an infection develops. Invasive fungal infections (such as histoplasmosis), bacterial sepsis and other opportunistic infections may be worsened by Enbrel, and in some cases have been fatal. Enbrel is not recommended for patients with pre existing disease of the nervous system, such as MS.
No studies have been conducted. Animal studies did not reveal toxicity to the fetus, however as animal studies are not always predictive of human response, enbrel is avoided in pregnancy.